Every once in a while you will find someone comparing a major scientific or technological challenge to the Manhattan Project - among such comparisons would be the Human Genome Project and the Brain Map Initiative. It's also not unheard of for drug discovery being uttered in the same breath as the Manhattan project; for instance administrators and scientists have been calling for new antibiotic discovery to be placed on the same footing as the wartime quest to build the first atomic bomb. To be honest, most of these comparisons obfuscate more than they instruct. It's not that they are entirely invalid, but their core kernels of truth significantly differ. To see why, let's compare a typically challenging, novel drug discovery project like finding a cure or mitigating therapy for Alzheimer's disease to designing Fat Man or Little Boy. The mandate for the Manhattan Project was, "produce a practical military weapon that works by harnessing energy from nuclear fission of uranium or plutonium". The mandate for Alzheimer's disease would be "discover and develop a small molecule that mitigates or cures the symptoms of Alzheimer's disease and that is potent, safe, enters and exits the body in a reasonable period of time and causes minimal side effects". The first thing to notice is the difference between the word "produce" and "discover". Manhattan was not a discovery project, and the word "produce" in fact appeared in the first line of 'The Los Alamos Primer', the indoctrination lectures given by physicist Robert Serber at the beginning of the adventure. Production is more akin to engineering than science, so that word sets the tone for the entire project. That is not to say that Manhattan did not involve science and scientists - of course it did. But the key thing to realize is that the basic discovery part of the science had been done between 1938 and 1942. This part was symbolized by four milestones: the discovery of fission in December 1938 by Hahn and Strassmann, the first 'proof of principle' calculations by Frisch and Peierls in March 1940 indicating the feasibility of a fission weapon, the working out of the actual mechanism and effects of a bomb in the summer of 1942 by Oppenheimer and his associates at Berkeley and the successful initiation of a nuclear chain reaction by Fermi and his associates in Chicago in December 1942. By the time the project started in March 1943, the atomic constitution of matter was thus firmly mapped and the elementary particles which were required to harness fission were all discovered and their properties charted as either 'known knowns' or 'known unknowns'. The major challenges associated with the project were thus not discovery challenges. It was fully known by the beginning of the project that if you suddenly bring a sufficiently large lump of highly purified uranium-235 together you would cause a very big bang. The key words there were 'large', 'purified' and 'suddenly' and these words really signaled the enormous engineering challenges. 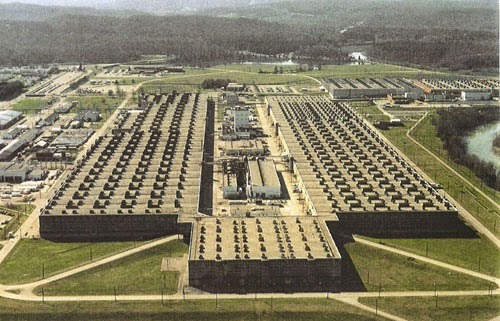 To produce a large and purified lump of uranium or plutonium would take vast chemical and engineering complexes in Oak Ridge, TN and Hanford, WA which employed hundreds of thousands of workers and whose use of resources like electricity and copper would rival the size of the US automobile industry. That was really mostly engineering, the unimaginably strenuous application of man and machine in separating two isotopes from each other and in creating a novel element. The 'sudden' part of the challenge was equally important and again heavily steeped in engineering. For the uranium bomb this was not a big issue since a heavy modified gun would do the job. The really novel find - and this would be classified as a discovery, albeit of an applied kind - was the mechanism of a plutonium weapon. In the summer of 1944 it was realized for good that given the spontaneous rate of fission of Pu-240 which was contaminating the samples of Pu-239 produced in the Hanford reactor, a gun-type weapon that would work for uranium would simply cause an equivalent plutonium weapon to pre-detonate. The solution circumventing this problem - implosion using shaped 'lenses' - was probably the most novel discovery/invention to come out of the Manhattan Project. The novelty of this solution was why they tested the plutonium bomb in July 1945 but not the uranium bomb. In fact implosion could be considered to be the one truly novel 'secret' to come out of the project. But again, putting implosion into practice was almost completely engineering. Brilliant scientists like John von Neumann did contribute in calculating how you would get a perfectly symmetrical, inward-looking shock wave to compress the plutonium core, but the key challenges were designing and fashioning the explosive lenses - layered arrangements of slow and fast-burning plastic charges that would alternately diverge and then precisely converge a shock wave - that would make implosion possible as well as crafting detonators that would fire simultaneously on the surface of the weapon to send the shock waves in. To that end the metallurgists and chemists at Los Alamos were put to work refining these plastic arrangements from hot molds, shaping them and smoothing out even the tiniest air imperfections in the form of bubbles that would cause the shock waves to deviate from perfect symmetry. Similarly experts in electronics were put to work inventing new timing systems for detonators. This work was all chemistry, chemical engineering, electronics and machine shop. It involved not exalted, Nobel Prize-winning minds but the most practical minds, minds which sometimes lacked even a college degree but which could work wonders with their hands (one of these minds happened to be that of David Greenglass, the spy who shuttled secrets to Klaus Fuchs). In fact this part of the project was so important that much of the details are still classified, and rightly so. Master the design of explosive lenses and you command the explosive consequences of plutonium. The culmination of all this engineering and science is well known, but the tone for that was set in 1943. No wonder Richard Feynman, when describing the Manhattan Project in his memoirs, called it "not science, mostly engineering". He was right. Now what if the Manhattan Project had been like a novel drug discovery project for Alzheimer's disease? The physicists working on it would still be in the dark ages. The equivalent of fission in Alzheimer's would be the mechanism(s) that causes it, both on the molecular level and on a more global level. We don't know that yet. The Alzheimer's equivalent of protons, neutron and electrons would be the molecular or epidemiological components that cause the disease. There are scattered clues about them, but we really don't know those yet either. Consider the rogue, misfolded protein Aß (amyloid beta) for instance: ten years ago it was regarded as possibly the major culprit in the disease; now it is regarded simply as something associated with the disease in a major way, but nobody knows exactly how. Every major clinical trial that promises to target interesting mechanisms and components in Alzheimer's has failed miserably over the last few years, which is probably not too surprising if we were in ignorance of the real molecular components and were targeting the wrong mechanisms to begin with. And even if we knew the mechanisms and the components, the ensuing development of an Alzheimer's drug is no mere engineering challenge. That's because even the most basic processes of drug discovery - things like getting drugs across cell membranes or even getting them to dissolve in an aqueous solution - are too poorly understood to be able to be predicted accurately. Thus, the engineering part of drug discovery is far more tied to a woefully deficient understanding of the science than the engineering part for the Manhattan Project was. The implication of this is that because prediction is largely futile, we have to test tens of thousands of candidates in drug discovery to see what works: What if the Manhattan project needed to build thousands of bomb prototypes to find the one that finally worked? The difference between bomb design and drug design is thus not one of manpower, resources or engineering; it is one of a basic lack of information and deep, dark patches of ignorance. And it arises from the fundamental complexity of biological systems compared to engineering systems. Thus, if the Manhattan Project were truly an Alzheimer's disease drug discovery project, the physicists working on it would have started not knowing about nuclear fission and not even knowing about protons, neutrons and electrons, let alone about cross sections or plutonium. Here's what their mandate would have looked like then: "Discover what stuff is made up of. Find if any of it can be manipulated to release large amounts of energy. And if you find this, then try to figure out if you can get enough of this special material to make a practical military weapon." In other words, there probably would not have been a mandate to build an atomic bomb in the first place. However I am ready to take bets on whether this mandate - given to all those brilliant minds in 1942 - would have led to Little Boy or Fat Man by 1945. Afterthought: So if the Manhattan Project was in fact mostly engineering, it's worthwhile asking why it's associated with science and scientists - and especially physics as opposed to chemistry which was equally important - in the public imagination. I believe the answer in one word is 'myth-making'. Men like Feynman and Oppenheimer are considered so brilliant and fascinating that they have inevitably come to stand in for the whole project. 1. Why chemistry (and biology) is not physics. 2. Why drug design is like airplane design. And why it isn't. 3. Derek Lowe on what he calls the 'Andy Grove Fallacy': 1, 2. 4. Why it's hard to explain drug discovery to physicists. "However I am ready to take bets on whether this mandate - given to all those brilliant minds in 1942 - would have led to Little Boy or Fat Man by 1945." I think you are being too conservative with that statement Ash. I would say that given the mandate as you frame it, it could not be done in that time frame. Richard Rhodes begins his story with the discoveries in 1895, 1896 and 1897 by Wilhelm Rontgen, Henri Becquerel and JJ Thompson respectively, making it a story of discovery and engineering. It is also a story intimately tied to the efforts of both American and British chemists and physicists and a fair number of German, Austrian, Italian, Polish and Hungarian immigrants. The Canadians were also in on the effort. The myth makers love to present it as an all American story dominated by physicists. They leave out the whirlwind explosion of discovery in both chemistry and physics that began before the beginning of the 20th century. My take on implosion is that it was the closest part of the project to an actual discovery that was made by those working at Los Alamos. It was a completely unknown technique. It required a chemical genius, Kistiakowsky, and the ability to apply not very well known theory to an actual working device. Those who I think do not get enough credit for the success of implosion include Robert Christy (the suggestion for the solid pit or core of plutonium) and Bruno Rossi (all those hundreds of implosion tests called the RaLa tests to prove the effectiveness of implosion) and Stanisław Ulam, a gifted mathematician who worked with von Newmann and Kistiakowski. But it’s a very big story with many more that I have not mentioned who deserve credit and certainly more than the myth that a couple on New Yorkers made it happen. Yes, that's exactly the point. The project was possible only because it could stand on the shoulders of a hundred years of fundamental discoveries in physics. That is precisely why describing an Alzheimer's disease drug design project or brain mapping project in those terms is futile, because those fields have simply not had the time to evolve and reach the stage of maturity that nuclear physics did in the 30s. As you say, developing a cure for Alzheimer's (or almost any other disease) is a very different challenge from developing the nuclear bomb. But when people suggest a "Manhattan project" approach, I tend to think they're referring to the scale of the project rather than the science/engineering. In other words, a project funded by the government on a massive scale to attempt to solve a problem of huge importance. According to Wikipedia, the Manhattan project employed about 130 000 people and spent around 26 billion dollars (2014 dollars). I'm not really sure if that sort of money would have a massive impact or not (given that it was over several years) but that's how I interpret the calls for a "Manhattan project" to solve "X". That's a good point. Injecting $26 billion into finding a cure for AD would be a tremendous development. It's just that much of that money would have to spent on exploratory research without any fixed endpoints. That's where the difference lies. Actually I don't even have a problem with politicians casually extending the analogy; I have a bigger problem with people like Sergey Brin or Andy Grove or Peter Thiel thinking that AD could actually be "solved" by "rational" engineering-type approaches. I think Derek Lowe had a similar topic or an expression in one of his blog posts and I remember leaving a comment there. Anyway; in summary, I don't agree with you and Feynman. The project itself might include more engineering than science (I still don't think so though). But, when we look at the outcome, I see more science instead of engineering. I agree a lot was known about nuclear physics even before the project. But, the project helped the scientists to learn much more than they could ever learn in their whole careers. I do believe that the project fast forwarded at least 50 years of nuclear physics/chemistry and computer science and technology. I used to consider it as an engineering project before reading Edward Teller's Memoirs. I strongly suggest reading it to anyone who haven't yet.